ARGH, I FORGOT TO POST ABOUT THIS! 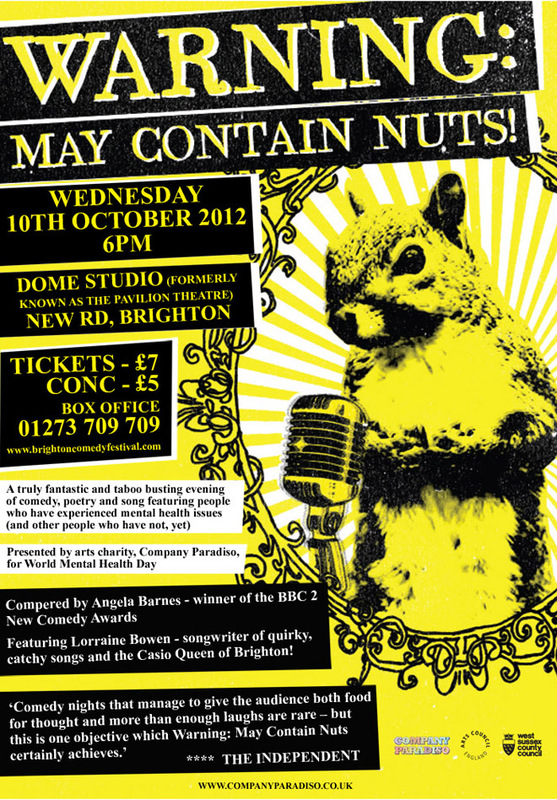 Warning: May Contain Nuts in the Brighton Dome tomorrow! Hooray! Warning May Contain Nuts is a fantastic project that I was involved in two years ago. People like John Hegley run workshops for people with mental health problems who write comedy, songs, poetry and prose. It’s no bullshitty, guilt induced lip-service either; it’s talent, fun, creativity and balls. I performed in it two years ago (I couldn’t this year, alas, as I’ve had the busiest few months in memory) and I had a fantastic time even though I was so nervous I felt like I was floating above the stage. Tickets are here and if you’re in Brighton, go! You deleted your last post. I know you don’t like me and I don’t wish to be a stalker but if you put up paypal (I’ll get over my doubts) I can help you out a bit. I just know where you are right now. That’s all. It’s a private post now rather than deleted. Why do you think I don’t like you? ‘I just know where you are right now.’ I’m talking feelings not location! You know, I’m not a millionaire but I have a few extra quid and you’re welcome. You can buy some new clothes. I’m not trying to own you, or make you feel bad in any way. It’s just that you make me feel like I know you and I could help a little, now and again. Put up the Paypal thingy and I’ll sort it. Probably tomorrow. It’s night time here.